A Highways Agency scheme to improve safety at the A50 and A500 roundabout in Stoke-on-Trent will get underway next week. The scheme begins on Monday 31 March and subject to weather conditions, will be completed by 6 June. The work will involve removing the free-flow lane on the southbound carriageway from the A500 to the A50. Three lanes will be installed on the A50 and one lane on Campbell Road. All four lanes will operate under new traffic signals. The work will also involve new road markings on the A500 northbound entry slip road and the A50 westbound approach to the roundabout. 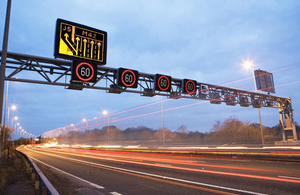 The work is part of a £317 million pinch point improvement programme designed to boost local economies, reduce congestion and improve safety on the strategic road network in England. The programme is part of the UK Government’s growth initiative, outlined during the Chancellor’s Autumn Statement in November 2011. The pinch point programme provides smaller scale improvements that can deliver big returns by easing congestion and making journey times more reliable for road users, including hauliers and commuters to help boost local economies and drive economic growth. “The work will improve road safety at the junction by reducing vehicle manoeuvres on the approach to the roundabout. In turn, this should result in fewer collisions. In order to minimise disruption to motorists, the work will take place overnight between 9pm and 6am. Diversions will be in place and clearly signed ahead of any closures. During the course of the work a number of full closures of the A500 and A50 in Stoke-on-Trent will also be necessary, to allow work to be carried out safely and quickly. These will be signed in advance and diversions will be in place.